ONE FOR THE RECORD BOOKS: Crowds cheer during the meet. Certain members of the team will advance to the NCAA Championships. 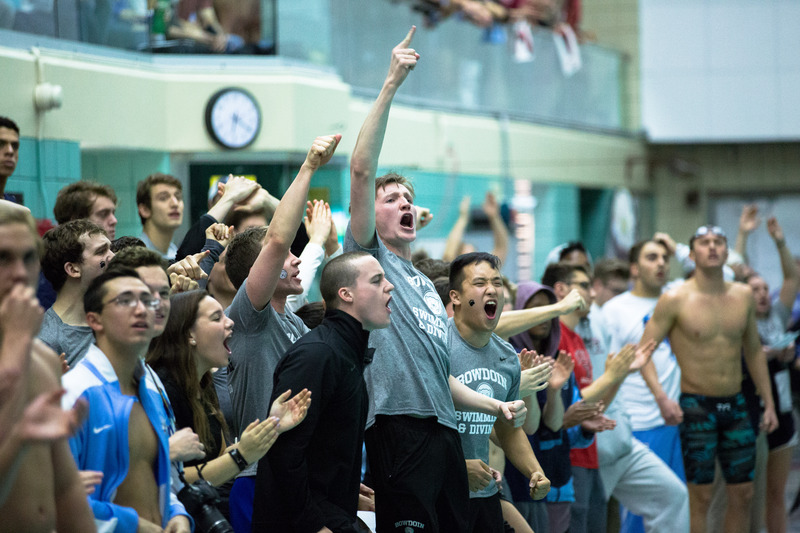 Over the last two weekends both the men’s and women’s swimming and diving teams finished NESCAC Championships with exceptional results. The women’s team scored just shy of 1,000 points, breaking the school record for most points scored in a single meet with 998.5 points, and the men’s team finished in a best-ever fourth place. According to Head Coach Brad Burnham, the women’s races came down to stamina. Marshall Lowry ’20 finished in the top three in all three backstroke events, while Rebecca Stern ’19 finished in an impressive third place in the three-meter diving event with a total of 434.70. Burnham believes that the men’s team put on a similar performance. 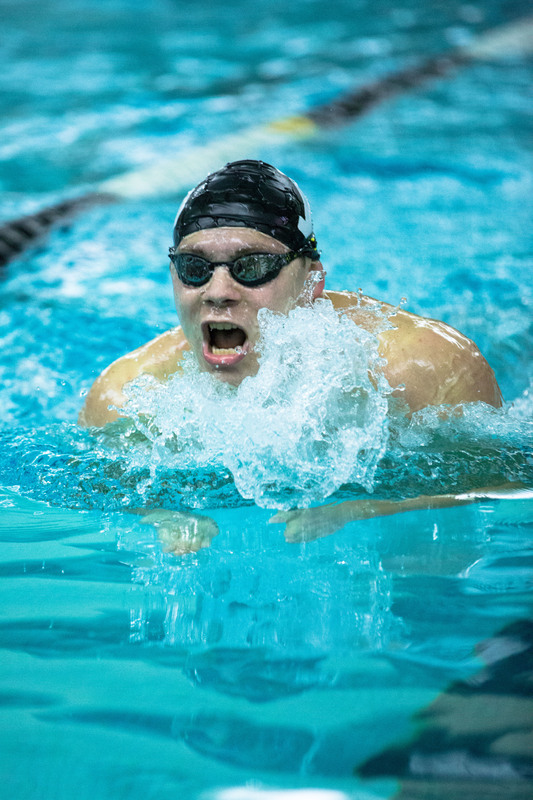 Karl Sarier ’19 was named Swimmer of the Year following three meet wins and Mitchell Ryan ’19 was named Diver of the Year after sweeping the diving events. Swimmers cheer on their teammates as they turn. 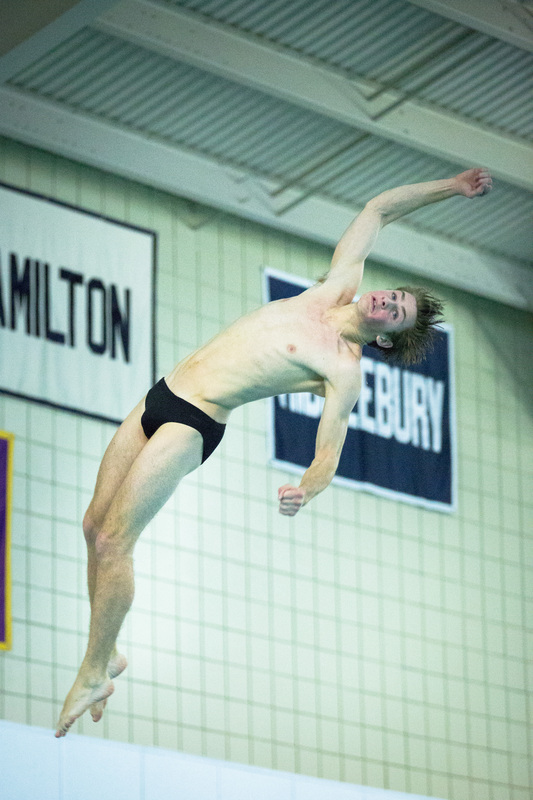 Mitchell Ryan ’19 swept all diving events at the NESCAC meet this weekend. 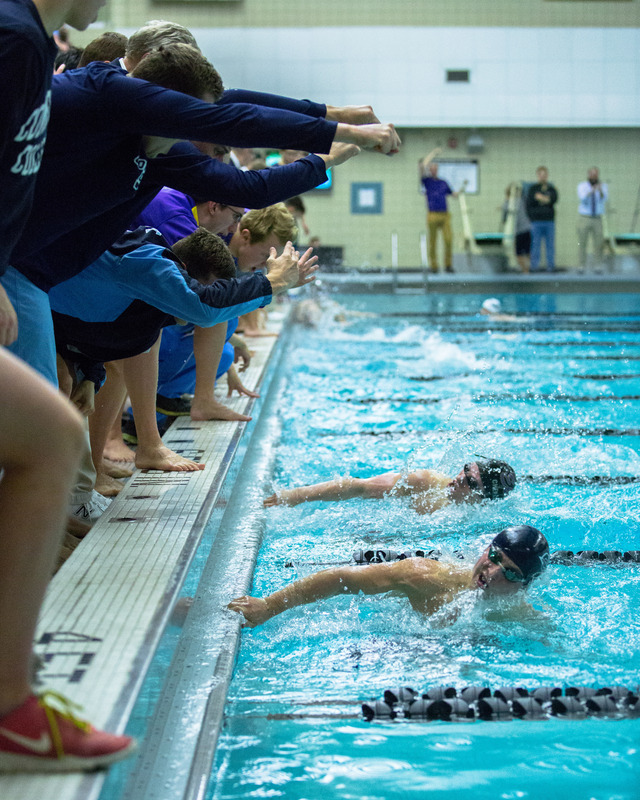 Finishing fourth and fifth for the men’s and women’s teams respectively represent major NESCAC goals that each team has been consistently working towards over the past couple of years. Because of the nature of the competition within the conference these finishes represent much stronger performances than one otherwise might think. Women’s co-captain Linnea Patterson ’18 shared Hutchinson’s enthusiasm. Now that the formal season of conference meets are behind them, both the men’s and women’s teams are continuing to train hard for their upcoming events at the NCAA Championships, which will take place in Indianapolis over spring break. Sarier and potentially Ryan—divers find out if they qualify this coming weekend—will compete at nationals for the men’s team. Additionally, Sterling Dixon ’19 and Marshall Lowery ’20 both qualified individually for the women’s team and Mary Laurita ’21, Amanda Banasiak ’20 and co-captains Paterson and Mariah Rawding ’18 will all be competing in relay events. Diver Thea Kelsey ’20 may also compete. In terms of expectations for nationals, Burnham revealed that since a lot of the swimmers in the group have already gone to NCAAs, they will all be competing to become All-Americans by completing the meet with a top-eight finish. 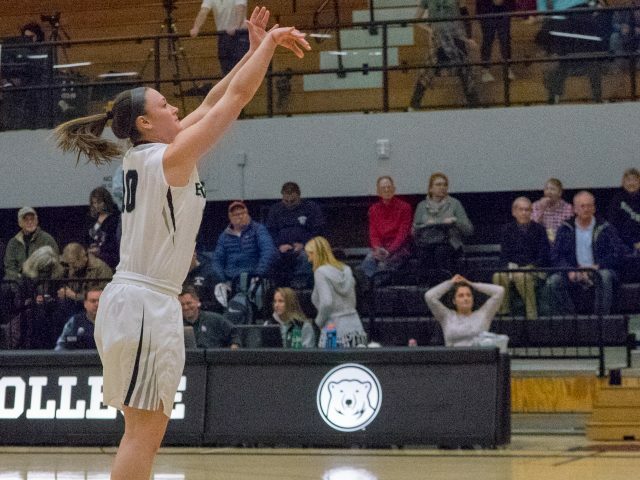 “I want to swim my last race as a Bowdoin Polar Bear and know that I left it literally all in the pool because that’s all there is, that’s all she wrote,” said Patterson. “For me it’s going to be my last competitive swim meet and I just want to have fun. I want to swim well and I want to go out with a bang,” said Rawding. Saving the day: The women’s hockey team (13-8-3, NESCAC 6-7-3) upset Hamilton (13-8-4, NESCAC 9-4-3) in the NESCAC Quarterfinals 3-1 on Saturday. This replicates the result from last year’s quarterfinals, where the Polar Bears beat the Continentals 1-0 in double overtime.